Available in Antique Brass, Antique Pewter, Black, Brushed Nickel, Hunter Bright Brass, New Bronze, or White. 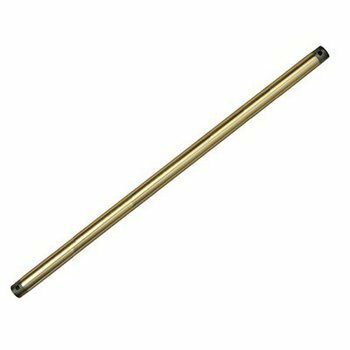 Emerson CFDR18 Downrod - 18"
Emerson CFDR1 Downrod - 12"
Emerson CFDR25 Downrod - 2.5"
Emerson CFDR2 Downrod - 24"
Emerson CFDR3 Downrod - 36"
Emerson CFDR4 Downrod - 48"
Emerson CFDR5 Downrod - 60"
The Hunter 72-inch Ceiling Fan Extension Downrod is perfect for 16-ft ceilings. Even rooms with steeply sloped ceilings or exceptionally high ones can benefit from a reliable, efficient Hunter fan. At 72", the downrod sets the fan at the proper height for optimum performance. Both ends have tapered single-thread construction for better hold when mounting the fan. At 3/4" wide, the extension fits Hunter fans, this extension is designed in a modern style and has multiple finishes to match Hunter fans in the same color. It is constructed from sturdy metal for durability and is appropriate for indoor use only.